Why sitting is the new smoking and what that means for your productivity. The tricks we use to get our bodies moving more, without having to do more exercise. Why "domesticated humans" will never be as effective as "wild" humans. The tools, gadgets and apps we use to stay on the wild side. Why the mind-body connection is far from trivial, for entrepreneurs and creative workers. Book: Movement Matters by Katy Bowman. Use a laptop stand like this one to give yourself a standing desk, floor desk and many other potential work positions on the cheap. Another good standing desk option is The Free Desk. Not as flexible, but more stylish and solid. Fitness trackers like these from Garmin or these from Fitbit can be surprisingly effective in getting you to move more. Studies like this one indicate that the way we experience our bodies and minds deteriorate with age may not be the norm. Do you want to hear more from Miquel and Matt? Check out the group podcast episode here! What was your favorite takeaway from this episode? Do you have other tips for working like an animal? Let us know by leaving a comment below. Also, if you have a question for me that you'd like me to answer on the podcast, send a tweet to @actigrow or leave a voice message below. Hi Shane, I am a Feldenkrais practitioner and a movement expert. This was a great podcast with solid background theory, I am really happy these ideas are spreading into the world! Thank you, Caterina! I’m glad to hear you enjoyed the episode. I hope we’ll see these ideas spread further and I think entrepreneurs are early to catch on to things like this. Please add links to the TED talk on fungal networks that Matt mentioned near the end of the podcast, and Movement Matters by Katy Bowman. This was a VERY inspiring episode. At age 67 I have noticed that it has become increasingly difficult over the past few years to get up off the floor. This podcast episode has inspired me to do something about that! Also, I recently “fired” the other marketing gurus I was following. Your podcast offers enough for me to focus on, without being distracted by endless emails from other marketing types. I’ve added a link to Movement Matters. I couldn’t find the video Matt was referring to, though. Sorry about that. don’t know if it’s true but a friend of mine told me that at Shell in the UK they found that smokers were actually more healthy than nonsmokers because they took more breaks and got more movement. Was not able to verify the story but she worked there so I guess it might be true. Another thing is to add regular breaks and stand up from your desk. Brendon Burchard recommends to take a break and move every 50min. The reminder turns my screen black every 50 minutes. I can postpone the break 3min for 3 times but if I want to skip the break completely, I have to type a longer text that reminds me how important it is to take a break. That’s a really interesting anectode. So, perhaps sitting is even worse than smoking? Regarding regular breaks: I find that’s something that just doesn’t work for me. I’ve tried this and I can’t stand it when I’m in the zone and get interrupted. I also notice that my deep work sessions usually last between 50 and 70 minutes. If I get stopped 50 minutes in and I’m 5 minutes away from completing my task, I just get frustrated. 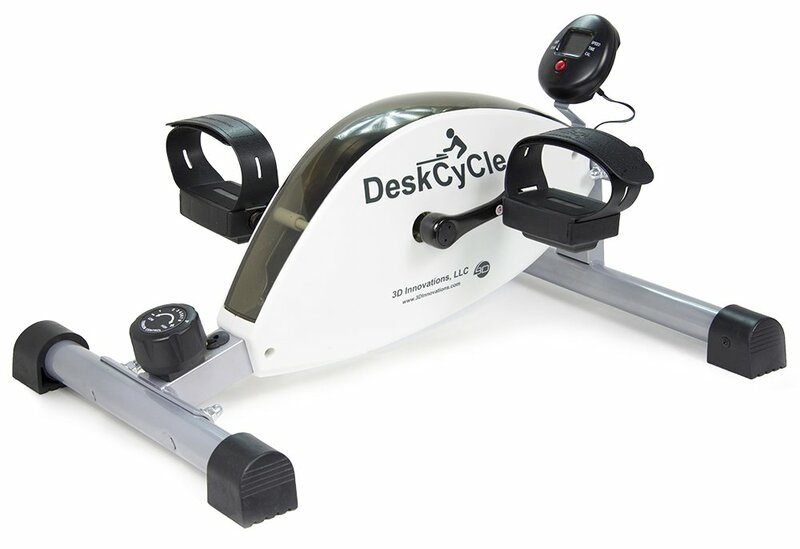 I have an exercise cycle that sits under my desk. I take cycle breaks often, especially while listening to podcasts, videos, or webinars.